Bookmaker apps do a lot more than just facilitate mobile betting these days. You can also watch live sports on your iPhone, find betting tips on your Samsung Galaxy or get the latest scores on your Nokia Lumia. As smartphones and tablets become more and more commonplace, sports and horse racing punters are increasingly making the switch from online to mobile betting. While the latest generation of apps offer all the same features that you will find on regular bookmaker websites, they also offer a number of additional benefits over their competition. If you are out with your friends or stuck on a long commute to work, these betting apps provide live scores and results from virtually every horse race and sporting event from around the globe. You can even watch live horse racing from the the UK, USA, Ireland or Australia on your Samsung Galaxy or iPhone. Some iOS/Droid apps stream free live video feeds of golf, NBA basketball, soccer, football, tennis (Wimbledon/French Open) and more. Hose racing fans can even get betting tips and study the racing form of any horse race worldwide. Audio commentary is available free of charge for those who'd prefer to listen than watch. Below is a list of our top rated sports betting apps for iPhone, Windows Phone, Blackberry and Android. U.S. CITIZENS - Please visit our U.S.A. Betting Apps section. 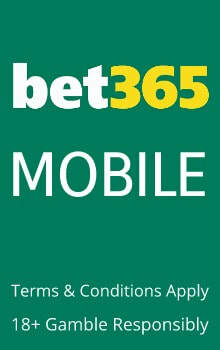 Bet365 Mobile bookmaker has been tested with Nokia, Blackberry, iPhone, iPad, Android and Windows Phone tablets and smartphones in our office. The views expressed are those of our reviewers and testers. iOS and Android users can also watch live streams of soccer, basketball, tennis, snooker, darts, cricket and every horse race from the United Kingdom and Ireland. Audio commentary of football, greyhound and horse racing is also available for free via the app. The Bet365 "Live Match" section provides real-time visualizations of soccer, rugby, tennis, darts and other sporting events. This is an excellent feature for anyone interested in live betting because it offers a breakdown of key events and statistics throughout every match. Before you place a live in-play bet, you can first get detailed information on possession, fouls, free kicks, throw-ins, showing kicks, sin bin alerts, penalties and more. More people use the Paddy Power app in the United Kingdom that any other bookmaker app thanks to the Irish bookmakers commitment to innovation. 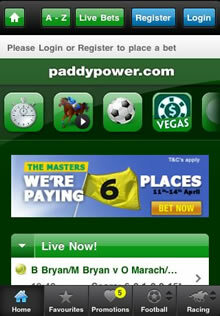 For example, Paddy Power stream more horse racing to their iPhone and Android apps than any other bookmaker. It is now possible to watch every horse race from the UK, Ireland, South Africa, South America and Dubai. Their app also offers exclusive betting tips from some of the world's top jockeys. The high-tech application allows users to bookmark their favourite markets, create coupons/accumulators and take advantage of all the betting offers, promotions and money back specials you can find on the main site. The PaddyPower Messenger apps allow their customers get odds and place lightning fast bets via text messaging. Coral are the third largest bookmakers in the United Kingdom, only behind gambling giants William Hill and Ladbrokes. Coral have developed native apps for Android, iPhone and iPad devices. They also offer an identical web app that is compatible with all types on internet enabled phones, including Blackberry, Nokia and Windows Phone. Coral have opted for a clean design that is very easy to navigate. Users have access to all the in-play markets offered on the Coral website, plus the app has a particularly good results section where you can find up-to-the-minute scores on every major sporting event. Horse racing fans enjoy racecourse weather previews, live video streaming, race card and enhanced betting odds. A dedicated tablet version has been developed for the Apple iPad. ﻿Sky Bet is part of the Sky broadcasting corporation that owns Sky Sports. Sky Bet now streams Spanish La Liga games every week to iOS/Android devices and over 4,000 live streams of horse races each year. Their web app also works on all internet enabled devices, including Blackberry, Windows Phone and Nokia Symbian. 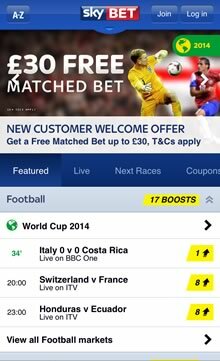 SkyBet Mobile lets you bet on over 800 football matches, 500 horse races and 20,000 individual sporting events every week. Independent betting advice and tips are provided by the "The Sporting Life" horse racing and sports portal. Listen to SkyRadio on your phone for all the latest sports and horse racing news or watch the popular "Soccer Saturday" show hosted by Jeff Sterling. 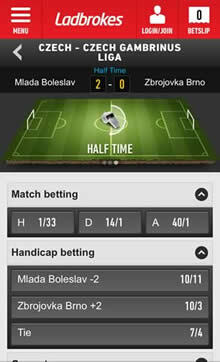 Football fans can quickly place accumulator bets via the easy to use mobile coupons section. ﻿William Hill Mobile is the United Kingdom's largest high-street bookmaker. The William Hill app offers more in-play markets than any other bookie and they also offer their mobile players a range of exclusive betting offers that are not available in their betting shops or website. 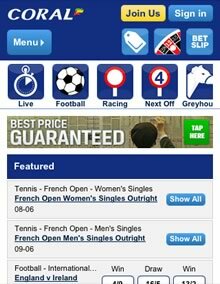 Users of the William Hill app can now also access the latest scores in real-time from every sport. Visit the "Hot Picks" section to quickly see the top 10 most backed horses at anytime. 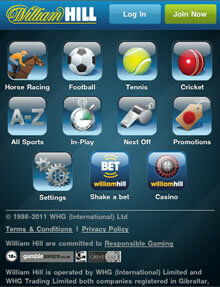 William Hill have recently launched a new iPad and iPad Mini version. BONUS: £25 FREE BETS for new customers. Probably the biggest reason to sign-up with Ladbrokes is their new free live streaming service. Anyone with a Ladbrokes account can watch a wide variety of sports on their Samsung Galaxy, iPhone or Windows Lumia phone. Their live streaming schedule is dominated mainly by soccer games from leagues in France, Italy and South American countries like Brazil, Argentina and Mexico to name just a few. They also broadcast quiet a lot of tennis tournaments and you can even catch the odd NBA basketball game on the app. Another reason to download the app is their exclusive "Price Boost" offers that are only available to mobile sports bettors. These offers are clearly labelled throughout the app and give users a chance to take advantage of some extremely generous betting odds. Ladbrokes have opted for a minimalist design for their bookie app that looks great and allows you to place wagers in just a couple of click from any iOS, Android or Windows Phone device. BetVictor (formerly Victor Chandler) have developed a top notch bookmaker app is is compatible with all Android (Samsung Galaxy, Motorola, Sony etc. ), iOS (including the iPad Mini), Blackberry, Windows Phone, Nokia and Sony Ericsson mobile devices. Bet on thousands of markets every week, including live events or watch live streams of every U.K or Irish horse race via their Racing UK and At The Races mobile streams. BetVictor have developed one of the best looking mobile betting apps, which is also easy to navigate. It also has an extensive results section if you just want to know the score of a particular game. The promotions page is also easy to access and offers a variety of free bets and betting specials. 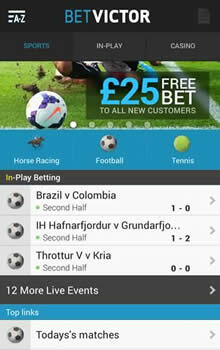 BetVictor regularly run betting promotions exclusively for their mobile customers. New customers get a £25 free bet when they place their first wager. The Brazil World Cup is only around the corner so we though we better take a look at the best iPhone and Android apps for World Cup 2014 betting. These apps offer team/player statistics, live streaming, news, interviews, betting advice and more. All the apps featured in our World Cup section are free. Every online bookmaker now offers a mobile betting app because of their customers desire to place bets and check results 24/7. As a result, the pace of development has been extraordinary over the past few years as each company tries to get the edge of their competitors by adding extra features to make their software more attractive. This is good news for sports punters who can now watch thousands of sports live or listen to audio commentaries from their Samsung Galaxy Tab or iPad. UK online gambling companies realize that mobile is the future and offer a variety of free bet deals and enhanced odds promotions in order to entice new customers to try their betting apps. This is great news for new players who can often get hundred of pounds worth of free bets just for signing up. The latest mobile wagering technology is HTML5 based so it works on any mobile operating system. Users of Apple, Samsung, Nokia or BlackBerry devices all have access to the same features and enjoy the same benefits. The Apple iPhone was the first modern day smartphone and is still the best selling mobile device on the market today. This means that iOS users are spoiled for choice when it comes to betting apps, as they have access to a wider selection than any other type of smartphone user. Sports tipping, live streaming and peer-to-peer social gambling apps can be downloaded for free from the iTunes App Store. The Apple iPad is also the best selling tablet in the world so many online bookmakers have developed iPad specific versions of their betting apps for the larger display screens. While the iPhone may be the world's most popular smartphone, Android is the undisputed king of mobile operating systems with a whopping 80% market share. Popular brands of Android devices include the Samsung Galaxy S5, HTC One, Motorola DROID and Google Nexus. Many Android smartphones come with larger screen sizes, which make placing mobile bets and watching sports on your phone super easy. Since Google do no not allow real-money gambling apps in Google Play, Android users will need to browse to sportsbook websites in order to access their mobile web apps. These internet-based apps are identical to native versions and facilitate mobile betting on football, baseball, hockey and basketball games. The once dominant Microsoft saw their market share dramatically decrease as more and more peopled ditched their PC's in favor of mobile devices. After a couple of missteps, the software giant struck gold when they purchased Nokia who released a range of quality products, such as the Lumia 520 smartphone and Lumia 2520 tablet. These high-end devices are perfect for sports bettors who want to browse the latest odds or get the latest scores from the PGA, NFL or NBA leagues. How do I download and install mobile bookmakers? That depends entirely on where you live and which device you use. If you are a resident of the UK, Ireland, Canada, Europe or Australia and you use an iPhone, you may be able to download the apps directly from the iTunes App Store. Unfortunately, gambling applications have been banned by Apple in many countries due to their antiquated betting laws. Thankfully, web based sportsbooks work just as well and can be set-up on any type of iOS, Android, Windows Phone or BlackBerry device by following these simple steps. Launch the browser (Safari, Chrome, Internet Explorer) of your phone or tablet. Browse to the website of your preferred bookmaker. Most online bookmakers have created redirects that will automatically take you to their web-app. Since you don't want the hassle of typing in the URL of a gambling website every time you want to place a bet, the easiest thing to do is create a bookmaker on your phones home-screen. This will create a little icon on your tablet or phone that will allow you to access the betting app with just a single click the next time you feel like taking a punt.